I wanted to take time to explore playing with my new line of paints (these will be available soon from Jerry’s Artarama) for the first lesson in my book. 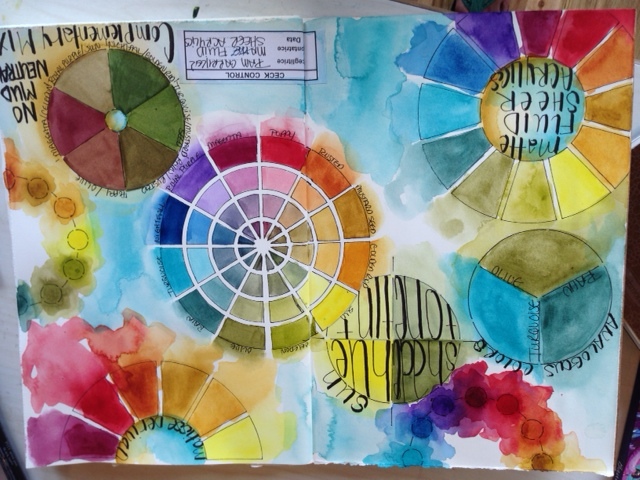 Color Wheels themselves are such a beautiful element to add to a journal page, so I made my page spread full of them! 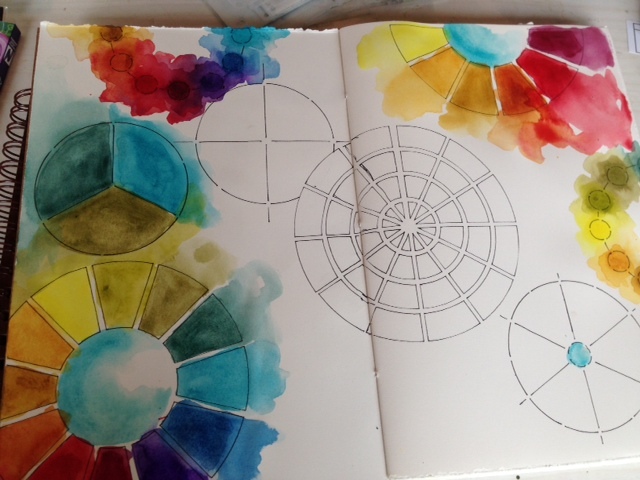 I used my Color Wheel stencils from my line at Stencil Girl Products. The paints are very sheer like watercolors only they are acrylic. I love to puddle them and layer them in a watercolor fashion. 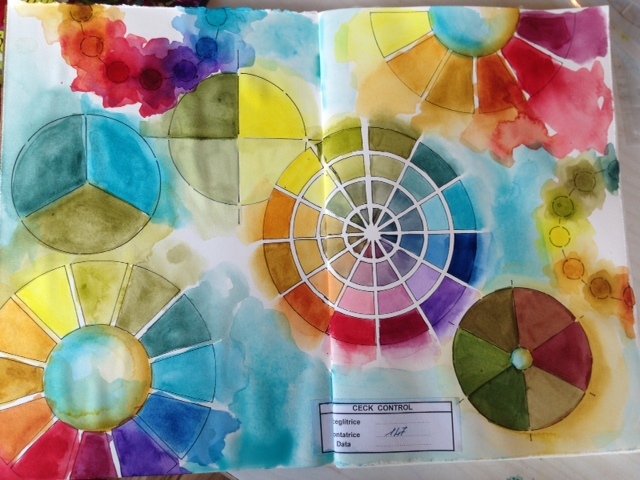 After I finished with the painting I let the pages dry and then added some journaling about the various color names, types of Color Wheels etc. Love the cheery, bright colors, a great opening page for my new journal. These acrylics look like fun!! 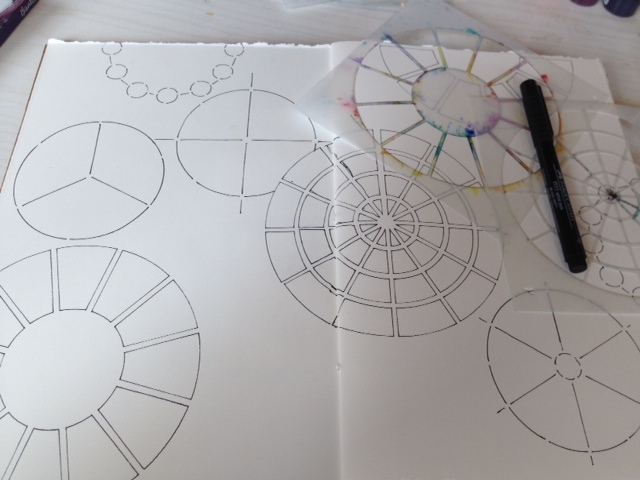 I just received my color wheel stencils from Stencil Girl today and can’t wait to use them!!! When will these paints be available and where? Love, love, love the look!!!!! Lovely! Congratulations on your new paints. Can you please tell us what is unique about them? How do they differ from other acrylics? …from other watercolors? Thank you! Me too! I’ve been anxiously waiting for Jerry’s to start carrying your new paints and inks since the workshop at Donna Downey’s. They are such great products. I really hope the wait is almost over and Jerry’s plans to stock up! Will the inks be made available at the same time?? Lovely! Congratulations on the new line of paints, once again you inspire me. I am so looking forward to the new paint line. As I’ve been doing art demos, I’ve been able to introduce folks to your Mixed Media Adhesive. 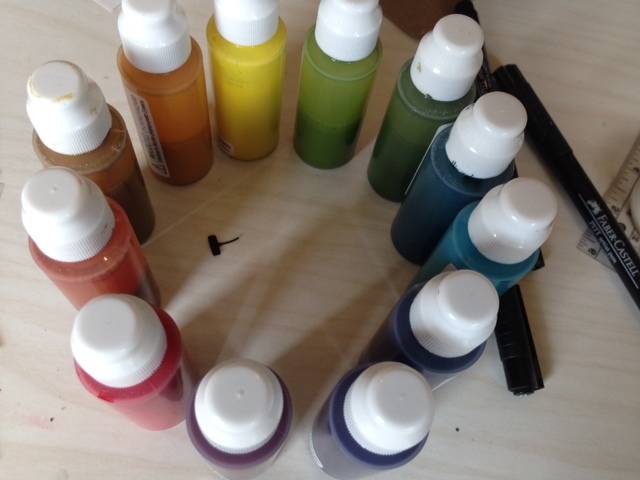 It will be lovely to show off your paints too! Hi Pam. I can’t wait to try your new paints. They look gorgeous. Also can’t wait to meet you at Create Dallas. Pam, when do you think Jerry’s will have the paints? I only see Da Vinci brand; is it going to be your brand. Looking forward to placing an order. A fun way to play with color. You are an inspiration. Creative Blessings! Pam, since the workshop at Donna Downey Studio, I have checked often to see if Jerry had your paints for sale. I can hardly wait to get my hands on them. this is really neat! I love the paints that are sheer like watercolors and what you did with them… this looks terrific! Beautiful journal pages! Love all the color!!! Inspiration!